“Happy Birthday to me!” Well it’s not actually my birthday but one year ago today, Ginger and Spice was born on Twitter! … my mum! Without her ‘Ginger’ would not be here. So today’s #5aday features 5 gifts to say thank you this Mother’s Day (10th March). The Cutlery Commission “Mum you spread joy” Butter Knife – Silver Plated Butter Knife with handstamped words @ £14. Meg Rivers Clementine & Almond Cake – Made of high ground almond content to give moist, dense texture @ £16. 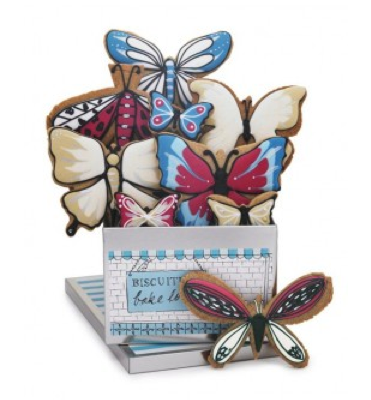 Biscuiteers Butterfly Mini Collection – Beautifully decorated butterfly chocolate biscuits @ £30. Notonthehighstreet Grapevine Gift Set by The Gluttonous Gardener – More original than a bottle of wine @ £44. Amara Neom Scent With Love Travel Candle Gift Set – 4 scented candles to stimulate body & mind @ £50. 5 lovely gifts to thank our wonderful mothers this coming Mother’s Day but which is the mother of all gifts in today’s #GTopSpot? Today’s #TuesdayTreats #GTopSpot goes to #3 Biscuiteers Butterfly Mini Collection – Mum’s the word! I love this photo! so true, mom did spread the joy!! !